Lowland trail is good choice to avoid snow when you want to stretch legs. Our backyard is filled with endless possibilities for half-day hikes during the summer. But during winter, Seattleites who don’t hibernate are pretty predictable. Many hit the lowland trails around Tiger, Cougar and Squak mountains until the high country thaws out by late spring. That’s why every weekend, the so-called “Issaquah Alps” fill up as Subarus and other vehicles overflow from the parking lots onto the shoulders of the main roads. You can avoid the mayhem. As an alternative, Margaret’s Way is maybe the best option to avoid the crowds of dog walkers and trail runners who clog the trails along the Interstate 90 corridor. Completed last summer with little fanfare, this 2.7-mile trail meanders from the west side of the Cougar/Squak Corridor to a handful of loops and short trails. Because it remains lesser-known — mostly neighbors hike here — the parking lot often sits half-empty. Before King County Parks, along with volunteers, carved out this trail on Squak Mountain, the Issaquah Alps Trails Club bushwhacked through the area. Club members concluded that a new trail would likely have to be short since it’s a challenging topography given the drainage creeks in ravines, the wetlands and the steep terrain, said David Kappler, club president. Margaret’s Way gains only 1,250 feet, a moderate hike that a reasonably fit person can do with little sweat. It doesn’t have the majestic views of East Tiger or West Tiger One. But at the end of Margaret’s Way, head southeast a couple hundred yards onto a long, narrow dirt path, Debbie’s View Trail, and you get a view of Mount Rainier and, on a clear day, the south Sound. Margaret’s Way also serves as a gateway to a handful of other trails including the popular Chybinski Loop to the north, and to the east, Bullitt Fireplace Trail, a popular picnic area. Part of what is now Margaret’s Way was once a privately-owned RV campground set to be sold to a logging company until locals and environmentalists lobbied the county to intervene to preserve this recreation area. The county parks agency obliged in 2014, buying this 226-acre parcel for $5 million with money from its parks levy, the Conservation Futures fund and real estate excise taxes. By next year, the county hopes to build an Environmental Learning Center near the trailhead to be used for school field trips. The county plans to expand this recreation area. Among possibilities is to put out bids for a zip-line operation, which would need Metropolitan King County Council approval. No timetable has been set for that, said Doug Williams, spokesman for county parks. 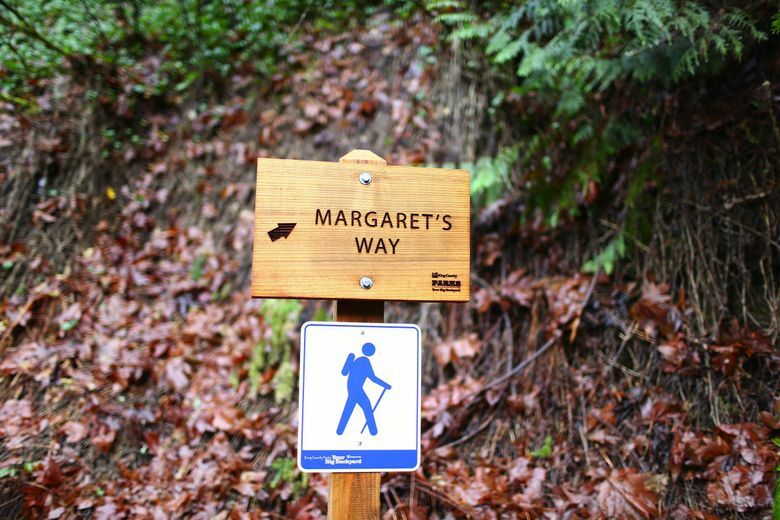 The trail’s name honors the late Margaret Macleod, an Issaquah parks planner who secured millions of dollars for conservation projects and helped preserve from development hundreds of acres in the Issaquah Alps and the surrounding area. Margaret’s Way has about a dozen switchbacks and a couple of short but steep stretches that can get slippery after a storm. But for the most part, it’s a gradual climb. A quarter-mile up, on a clear day, you get a southwest view of the Olympic Mountains between the hemlocks and big-leaf maples. 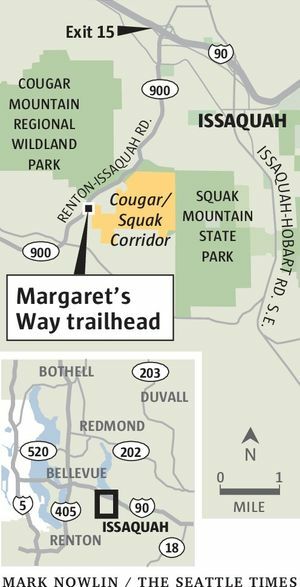 The trail then transitions into an alder forest that “is just beautiful when the leaves change colors,” said Jen Gradisher, of Washington Trails Association, which helped build Margaret’s Way. A half-mile up, the trail is under cover of the dense forest. Part of the trail follows an old, steep service road, which can get slick and muddy. Later this year, work crews will reroute that part of the trail to higher ground to make it less prone to flooding and safer for hikers. 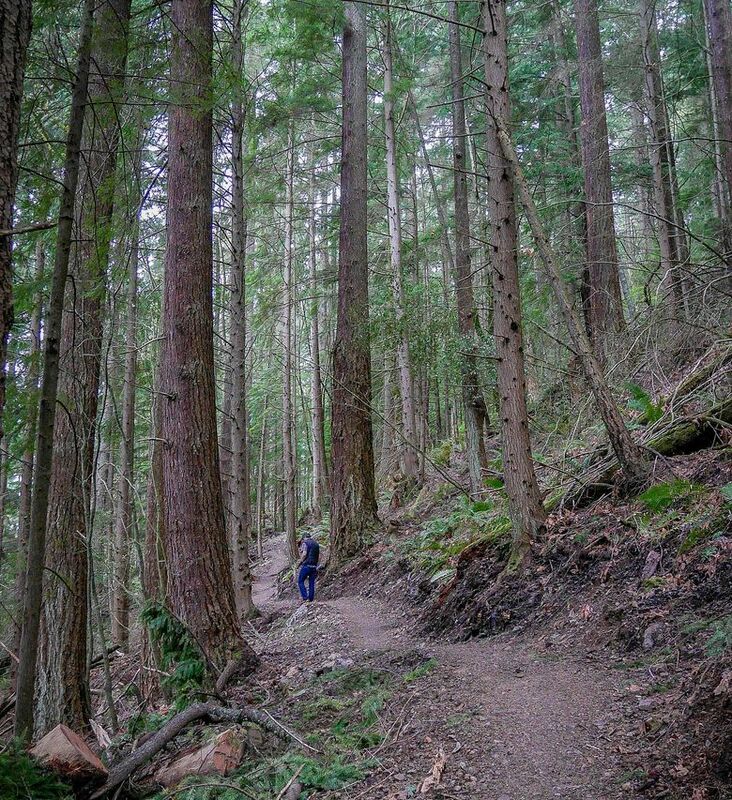 About 1.5 miles up, the trail zigzags through a forest of second-growth Douglas firs. Dress warmly. On a recent visit, I could hear the whistling wind on the south-facing side of the mountain. Two downed hemlocks blocking the path foreshadowed the windy conditions that awaited us farther up. Before they could even carve out a trail, work crews had to clear a number of giant trees that toppled after rainstorms. “We burned a lot of chain-saw gas on this trail,” a parks spokesman said. Margaret’s Way trailhead is at 10610 Renton-Issaquah Road S.E., Issaquah. From Interstate 90, take Exit 15 and drive south on Highway 900 toward Renton for 3.7 miles. Look for the entrance sign to the Cougar/Squak Corridor Park. Not wheelchair accessible. Dogs must be on leash. No mountain biking allowed.